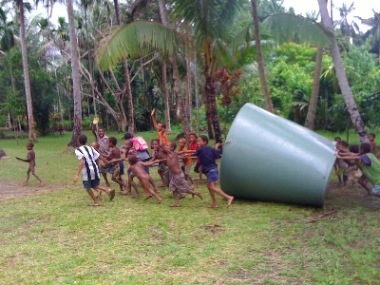 A couple weeks back, I and my co-worker, Bev, went out to the far West Sepik, near the Indonesian border. We were spending several days doing some more work flying school building materials into two remote villages with the helicopter. Each night we stayed with Murray and Carol Honsberger, translators in Baiberi, a small village near where we were working. It was a neat time of fellowship with them in the evenings. 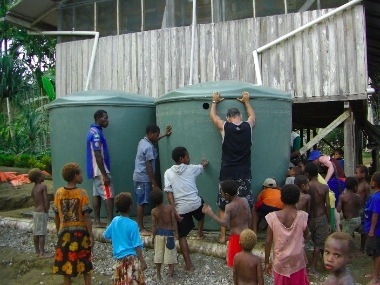 While we were out there, we used the helicopter to fly two large water tanks into their village. These are needed all over the country to set up fresh rainwater supplies for the people. In most villages, all the water comes from nearby rivers and streams and often it is unclean and the source of much sickness and disease. These plastic water tanks that catch rainwater off of corrugated iron roofing bring water close by and save many from sickness. The morning after I got the tanks into the village, we were getting ready to go to work moving the school materials, but the helicopter would not start. It was a simple problem, but we needed to have an airplane and mechanic fly all the way out to a nearby airstrip (3 hour hike away) with the part to get us going again. This mechanical failure allowed us to spend all that day getting the water tanks positioned and plumbed, ready to receive fresh water off the Honsbergers' house. 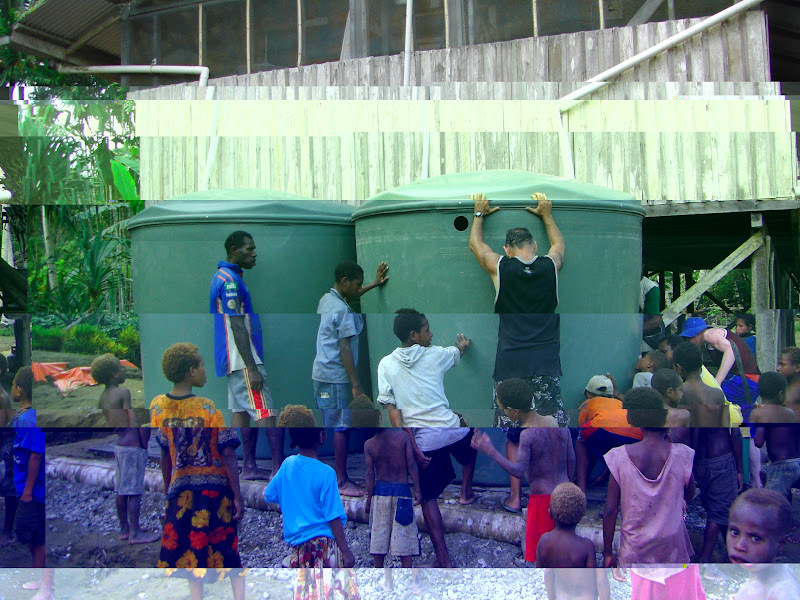 We got a good bit of rain that night and the following morning people from the village were gathering their water from the tanks instead of the muddy river nearby. When the helicopter did not start, it was a real frustration and totally changed our plans. God knew exactly what He was doing though. Proverbs 16:1 says, "We can make our own plans, but the Lord gives the right answer." What a great reminder to submit ourselves to the Lord in all that we do!